Sir Trevor Brooking has called for nominations for the Football Association’s third annual Respect Awards. As part of the FA’s Respect programme, the Respect Awards seek to recognise and honour the very best leagues, clubs and individuals that promote high standards of behaviour in the English grassroots game. The FA is looking for outstanding success stories, whether it’s a league or a club’s promotion of Respect and fair play or the outstanding contribution of an individual in helping to tackle abusive or anti-social behaviour. Part of the wider Respect & Fair Play Awards that cover the whole spectrum of the game, there are three Respect Award categories for grassroots football - Adult League, Youth League and Grassroots Club - with prizes of £2,000 or more for the winners plus an invite to the 2012 FA Cup Final as special guests of the FA. Last year, Prime Minister David Cameron presented the awards at Wembley Stadium before an audience packed with football luminaries. 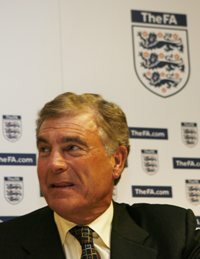 FA Director of Football Development Sir Trevor Brooking said: “Like all football fans, I love the beautiful game. The highs, the lows, the passion. I’m also amongst those fans who are ready to stand up for the game I love. "The FA’s Respect programme is all about tackling abusive and anti-social behaviour and through Respect, we are making some great progress. FA research suggests that since the Respect programme was launched in 2008 standards of player and spectator behaviour and the general environment of youth football has improved. There are now 6,000 more referees in grassroots football than there were in 2008 and 850 leagues have shown their commitment to the Respect programme. Over 20,000 people have also signed up to the FA’s Respect FC, on the back of which the FA has invested £100,000 on around 2,000 pitchside barriers for youth leagues across the country. To nominate an individual or club for the FA Respect Awards, complete this application form and email it to respectinfo@thefa.com no later than Friday 30 March. Leagues put forward for the FA Respect Rewards Scheme will also be considered for the FA Respect Awards. The scheme recognises commitment to the Respect programme with four levels of rewards: commended, bronze, silver and gold. Leagues committing themselves to highest standards of Respect and Fair Play may be in line for some top prizes - including the chance to stage a league cup final at St George’s Park - while the very best leagues will also be considered for the FA Respect Awards. To nominate your league for the FA Respect Rewards Scheme, complete this nomination form and email it to respectinfo@thefa.com by Friday 16 March. Tell us about the good guys! Club Website supports the FA Respect Programme so, if you are nominating a league, club or individual for an FA Respect Award, we'd love to know all about it. Either leave a comment below or email us at clubnews@clubwebsite.co.uk and, even if you're not recognised by the FA, you can still get a mention on Club Website!